Sitting at work for hours every day could be damaging your health and reducing your life expectancy - are standing desks the solution? While the idea of standing rather than sitting while you work has been around for a while, particularly in America, it’s gained more popularity in the UK over the last few years. So, what’s all the fuss about and should you consider it for your office – if you haven’t already? There is plenty of evidence-based information about how sitting down for long periods is linked to a range of health problems. These include dry eyes, carpal tunnel syndrome and back and shoulder ailments resulting from bad posture while at your desk. Did you also know that it can lower your metabolism, encouraging fat storage and therefore weight gain? Most worryingly of all, studies have linked it to a reduction in life expectancy, by increasing your risk of diseases such as heart disease, obesity and diabetes. 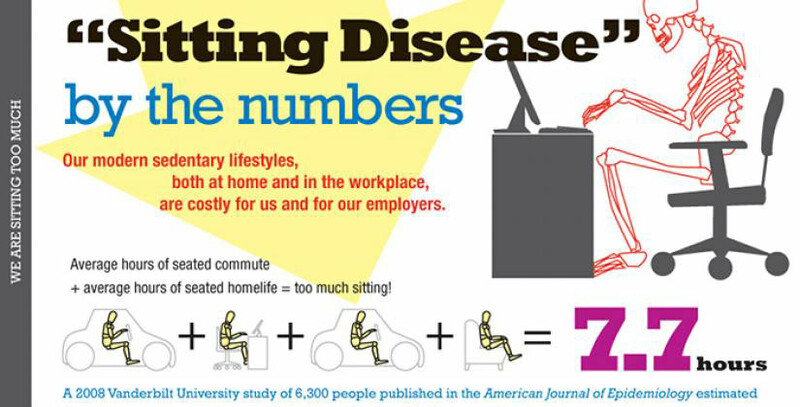 Just search online for the health risks of sitting if you need more convincing. settling down for the evening with a meal and watching a bit of TV. But surely if you are energetic outside of the office that will help, right? Yes, being more physically active is a great way to improve your fitness, help you to maintain a healthy weight and reduce your risk of a range of health problems. However, given the number of hours many of us are sedentary at work, exercising for half an hour a day isn’t enough to counteract the negative effects of sitting for so long. As sitting is bad for you, some have advocated standing at work. This idea is not new - apparently, the likes of Winston Churchill and Ernest Hemingway worked while standing up. So could this be the solution? Several studies, including one conducted at the University of Chester, found that standing instead of sitting increases your heart rate and the number of calories you burn. Many workers state that they have more concentration and feel more energetic standing up too. However, like sitting, there are negative effects to standing for hours at a time. It can be more tiring, particularly for your feet and legs, but it may also increase your risk of developing varicose veins and hardening in your arteries. Perhaps the main point to take away is that both sitting and standing can be bad for your health if you do either exclusively for long periods of time. Ideally, you should aim for a mixture of sitting and standing, but depending on the work you do, that might be an impossible task. So what can you do while at work? Have micro-breaks. Stand up or move around for a couple of minutes each hour to give your body a rest from sitting in the same position. Who would have thought making a cup of tea for your colleagues would actually contribute to your overall health? Alter your behaviour. Instead of emailing a colleague at the other end of the office, get up and speak to them. Go for a quick walk (or run) on your lunch break. Can you have standing meetings or stand while you’re on the phone? This will depend on the type of work environment you have, but if you explain the positive impacts movement can have, colleagues are more likely to give it a try. Rethink your office furniture. Adjustable height desks give you and your staff the ability to switch between sitting and standing. However, these can be quite expensive. Consider whether you could manage the same effect using high tables and bar-stool-like chairs. Or if you’re not keen on high desks, there is a range of ‘active sitting’ furniture, e.g. balance balls and kneeling chairs, which claim to keep your core muscles engaged while you’re sat working. Lynsie has been a contributor to the BizSpace blog for several years, with a particular interest in productivity, work-life balance and digital hacks. Although she now mostly works on website developments, SEO and reputation management, she still has a penchant for spotting typos in other people's work.